Within the first five minutes of Romeo and Juliet the audience is treated to; a pyrotechnics show, a flying live bird, amplified kettledrums and a movie star arriving on a motorcycle. It isn’t until the arrival of the Capulets, all played to beautiful perfection, that we realize that this is a show that has something for everyone. Under David Leveaux’s direction this Romeo and Juliet is in essence two plays. The Montagues all appear to be Caucasian and far paler in most respects to the Capulets. The Montagues all seem to be British while the Capulets are American. This blatant use of differing accents might be apt if the setting was the Revolutionary War. But the setting is undefined. There is a bit of sand and an enormous faded fresco wall with graffiti that intentionally or not evokes the opening credits of West Side Story. The costumes are mostly subdued hued flowing Eileen Fisher type garments, and some people don’t wear shoes. In short, we’re not sure exactly where and when this is taking place, but we do know that shiny modern (and loud) motorcycles have been invented already. The duality at play goes far beyond skin tone and accents however. The actors surrounding Romeo (Orlando Bloom) seem subdued. The fight scenes are hesitant and involve little touching (as if the actors were marking the scene.) Mr. Bloom is the most physically timid and we can almost hear him count out his moves. It doesn’t make for very interesting fight scenes, and it is a bit difficult to discern who is supposed to be injured. 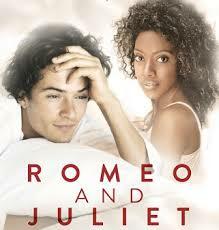 The physical hesitation becomes even more jarring when Romeo is paired with the fluid Juliet (Condola Rashad). Her lithe youthful movements in contrast to the (significantly older) Bloom’s rigid timidity make the age difference all the more glaring. Their scenes together often shift into consecutive monologues as it’s impossible to see what’s between them. We are certain that Juliet is smitten, but are never quite sure what Romeo feels. Several times, when Mr. Bloom could be heard and understood, I found myself wondering; is he sad is he happy? The restraint of all of the Montague players is in such contrast to the bold performances of the Capulet clan. When Juliet, the nurse (Jane Houdyshell) and either parent; (Chuck Cooper) and (Roslyn Ruff) are on stage, we’re watching a different play entirely. The theatre comes alive with their modern and passionate interpretation. They are subtle and fierce and funny and wonderful. The fresco wall moves in several ways throughout the play and makes for a simple unobtrusive backdrop. It’s a reprieve from the frequently used blasts of fire. There is a large bell hanging from the fly throughout most of the play. It’s purpose and/or symbolism is not entirely clear. The music (when not being used to demand the audience’s attention) is a lovely addition. The cellist (Tahirah Whittington) took to the stage to play during the party scene and helped to create the most dramatic and delicious moments of the production. Luckily there are enough of these exquisite scenes to satisfy those who enjoy such things. There is also plenty to make special effects fans happy. And the people who come to see a movie star stand on a stage and speak will be satisfied as well. It is an interesting balance Mr. Leveaux has achieved.